Regency Bone China Query - Antique Maker? Regency Bone China Query - Antique Maker? :- Can you tell me if you know anything about a mark, in gold on the bottom of cup and saucer, that says Regency genuine Bone China Made in England. There is no other marking or logo. The actual cup is pink with roses in the bottom inside, plain apart from two gold lines on the outside, base of the foot, handle and rim. The saucer also has roses in the middle and otherwise plain apart from gold rim. The cup feels quite rough at the bottom inside (not sure what that is). I collect tea cups for fun and have never seen this mark and can't trace anything on the internet. Mostly I'd like to know more about the factory and the cups likely age. To:- Regency Bone China Query - Antique Maker? First, the easy bit. I'm told by those 'in the know' that the bottom of your cup is rough because you can feel the bisque (unglazed) part of the ware. Now on to your real question. Regency China Ltd are a nice little maker founded in 1953, situated very near to the famous Sutherland works of Hudson & Middleton works in Sutherland Road, Longton, Stoke-on-Trent, Staffordshire. between Hudson & Middleton and Regency China, as the potters of an area are often interrelated. I know that Chapmans (Atlas) were definitely involved with Hudson and Middleton as I am researching their history at the moment from individuals' first hand experiences. However, the reference books do not show this connection at the time. Since this query was published, I have been lucky enough to find a wonderful expert on Hudson & Middleton. Click on my Staffordshire China link and scroll down to find a potted history of Staffordshire China Makers HUDSON & MIDDLETON, written by Helen Gregory (nee Chapman), part of the Hudson and Middleton dynasty, whose family connections to the firm make for fascinating reading! Here you'll find personal recollections, historical information, and even photographs of workers in the factories in bygone days. If Helen's very detailed contribution doesn't answer any questions you may have, please feel free to contact Helen via the comments section at the bottom of that page. Helen has also been kind enough to contribute a Staffordshire China Hudson & Middleton submission. Thanks for getting behind the site, Helen! We value your contributions. Comments for Regency Bone China - Antique Maker? Sorry, the short answer is no. We don't deal with valuations in this forum as it is 'off-topic' - This forum is about pottery mark identification only. I also have a piece of Regency China, a small decorative plate with a vixen and 3 cubs. The gold markings are at 9 o'clock, otherwise markings are similar. I think it is something to do with dating. 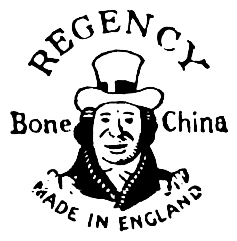 Regency china was a stoke on Trent business, owned by my uncle Harry Whalley. The business went into liquidation over 10 years ago when he sadly passed away. He had a keen interest in birds and flowers and this is represented in his lovely pieces. A fantastic gentleman and business man. Many thanks for putting a name to this firm and telling us the family background . That is what this website is all about.... Great post! I have found two versions of the Regency China lily of the valley design. One has more coloured and better drawn florals and more decoration; specifically flowers inside the cup and three motifs on the saucer. The Regency mark is in gold. The other version has a similar, but simplified design in cooler colours, no flowers inside the cup and only two motifs on the saucer. The Regency mark is in blue and yellow. The most likely reason for the gold flecks that you've seen on the bottoms of the cups is the craftsman applying the gilding was merely testing the flow of the material in what is the most inconspicuous place on the piece: the bottom. The gilding is genuine gold, and as such, the amount used is out of necessity, kept to the bare minimum. The craftsman would have to meet certain requirements for appearance, etc. in the application of glazes and gilding while minimizing the amount applied, hence the small dots, flecks, lines etc. that people find. The craftsman was simply checking the consistency and flow of the gilding prior to applying it to the rest ot the piece. Patterns, designers, groups or individual craftsmen are, if at all, identified by numbers, letters, a unique mark, or something similar. I have a Regency teacup with the fruit pattern, pear, grapes, blackberry, and it has a little gold fleck on the bottom. I think you will find the gold fleck on the bottom of china is so the gilder can be identified. Most of the gilders were on piece work, which meant they were paid for the amount of work they did. I have found a beautiful regency cup and saucer which is white with very small grey/silver and red leaf print all over the cup. With a swirl of silver that looks like a stem in between. It reminds me of the wind blowing the leaves around, kind of pattern. It also has a gold handle and base plus rim the has a touch of gold to it.. I would love to know the name of the pattern and where I could locate a set. It's so pretty. It reminds me of home. I seem to remember that Regency china was owned by the Locket family of Blurton, am I wrong ? I too have some Regency Bone China with the Pear and Grape motif. I have been attempting to research the history of the company so that it may help me valuate the items that I do have. If you have any more information, please respond to this post. I have a 4" Regency bone china decorative plate or coaster, trimmed in gold with a spray of purple flowers in the center. I think it might be from the 1950s. It belonged to my grandmother. I appreciate all the information here on the Regency brand. I have 6 regency floral tea cups with matching saucers. Does anyone know the year of when these were made? One stamp on the bottom is in gold and others are yellow and blue. Beautiful pieces! I would love to know the years of the pieces.